As hamster owners everywhere can tell you, hamsters are very fun loving and adventurous. They love to play and explore, which may leave you wondering how you can keep your furry friend safe when you let him out of his cage to roam around. 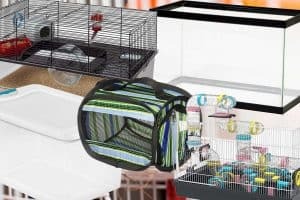 I have some tips and tricks learned from both research and years of personal experience with hamsters of my own that will help you hamster proof your room. Hamster proofing a room is all about keeping your pet safe. To do this effectively, you must identify any objects that might be dangerous to him while he is playing outside of his cage. Make sure there is nothing loose on the ground that he could eat or chew. Secure cords out of reach, block off escape routes, hard to reach areas or places he could climb on then fall off. Remove other pets or potentially poisonous plants. My family has always had hamsters as pets and over the years I have come up with several strategies for the tasks outlined above. 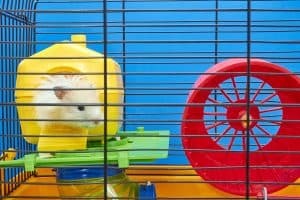 Keep reading for my list of 10 easy steps you need to take to effectively hamster-proof any room. Without further ado, here’s the list of steps you need to go through when hamster-proofing a room in your home. Hamsters love to eat and will chew on anything that they see. They may do that just to figure out if this is in fact food. They don’t see very well, so tasting may be their only recourse of action! Read here about how your hamster sees the world to learn more about hamster senses. The first thing that you will want to do is look over the floor to make sure there are no loose items lying around that your hamster might try to eat, as he could choke or be poisoned. Pay special attention to edges and corners, as well as under furniture or other areas where it is difficult to see. Which brings me to the next item. Make sure all power cords and wiring are secured out of your hamster’s reach. Bundle them together with ties and tape or mount them to the wall where he won’t be able to reach. If that is not entirely possible due to the location and length of the cords, run them through a piece of plastic pipe for the portion that is along the floor and within chewing distance. A hamster would love to chew on the power cords to your lamps, television or other electronics, which could potentially cause a fire or damage to your home or appliances and injury or death by electrocution for your pet. Block off any heaters or air conditioning units or vent. If you have a space heater in your room, you must make sure that your hamster can’t get to it or he could get burned or catch fire. Block any vents were the opening is large enough that your pet could squeeze his head through or fall into, especially if you own a small breed. A hamster running through the HVAC ducts could cause serious damage to your home, not to mention the danger to the hamster himself. Carefully check the perimeter of the room for cracks or holes that your hamster could escape through. They can squeeze into surprisingly small spaces, so make sure that you block or plug off any possible escape route. Hamsters are very flexible and if they can get their heads through a hole, then they can get their bodies through. Hamsters are also short-sighted and have poor depth perception so make sure that there is not anything that they can climb on that they could fall off of. Some hamsters love to climb and jump so you will need to make sure there is nothing within reach that they can grab onto, or leap across, like stairs. Hamsters have been known to reach up to grab a step and pull themselves up, one by one until they have climbed a staircase, or they have climbed up the side of a sofa or chair and managed to reach items that you might not expect. It is important to be aware of where your pet is at all times, so as to not accidentally sit or step on him if he is hiding. They are small, and it can be very easy for them to be injured. That’s why you should always supervise your hamster – even after the room is ready. Hamsters love to burrow in or under things and can climb or jump up onto chairs and sofas, and hide under pillows or cushions, which makes it very easy for the unsuspecting seat occupant to sit down on one. As an extra precaution, remove pillows and anything else that a hamster can hide under. Since hammies are small and can get into tight spaces, it is advised to block off spaces under furniture, like end tables and couches. If there is an opening in the underside of the piece of furniture, they could crawl inside and get stuck, or burrow into your couch or chair through an opening or tear on the underside of the furniture. You should not use foam, as the hamster could easily chew through this type of blockage and become sick. Look for something solid to place under the furniture, like wood or hard plastic as a deterrent instead. Be sure to place any plants out of reach and check the floor for leaves that may have fallen where your pet could eat one. There are several plants that are toxic to hamsters and could make them sick or worse. If you don’t know if your houseplant will harm your pet, consult a veterinary professional, or err on the side of caution and move them all up and out of the way. Once you are ready to get your hamster out of his cage, take any other large pets that you have to another room, then close the doors. A cat or dog could seriously injure or kill a hamster easily, even in play. 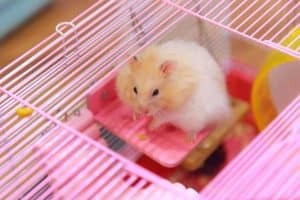 Even if they did not actually catch him, a hamster would be very scared and stressed, which could damage his health and well-being. Pay attention to your pet hamster whenever he or she is out of the cage. You will be able to tell when he is ready to return to his cage. Hamsters like quiet, calm spaces, away from loud noises or the television. If your pet seems to be getting cranky, take him back to his home, put him away where he can rest and calm down. You can read more about that in our guide about getting hamsters out of their cage for some playtime. Hamsters are escape artists, so if your pet gets out of his cage, don’t worry! If you have followed all the tips above, he will be in a safe space until you are able to find him. Below are a few helpful hints to getting your hamster to come out of hiding. Open his cage door wide. He might get tired and ready to come back to his own space on his own. Make sure that his food bowl and water bottle are full. Place a few bits of food in the floor out in the open. Once he get hungry enough, this may entice him to come out to find something to eat. Check in any loose boxes or bags. Hamsters love to burrow, so they can hide inside these items easily. Look carefully in and under furniture to make sure that he has not wiggled his way into a nook or cranny that you missed in the steps above. Enjoy Playing with Your Furry Friend! Preparing the room before you let your pet out is the best way to keep him out of harm’s way. He will be used to the safe environment of his cage and unaware of anything that might be harmful to him while he is out. As long as you have taken the time to address any potential dangers by following the steps above, your hamster will be safe to run and play to his heart’s content. Remember, nothing replaces your constant supervision. When your hamster is out of the safety of her or his cage, it’s your duty to be there too. No matter how well you hamster-proofed the room, the little critters are never safe on their own in a home environment. Besides, time spent outside of the cage is the perfect time for bonding and playing, so make the most of that! And if you’re looking for ideas on what to do in that safe room, check out our article about how to play with your hamster.